Want a free pergola plan? We’ll email it to you. Click here. Another option in pergola design is displayed here – a curved roof pergola. This is possible with most varieties of wood and synthetic materials and is well worth the effort to create a very unusual and softer line to the structure. The posts and rafters laid from front to back are the only straight pieces. The beams and side to side rafters are all curved. The roof pieces are also placed rather close together in the pattern to create a nice spot of shade. A curved roof pergola is a bit more expensive, but it is well worth it since they are quite unique in style. 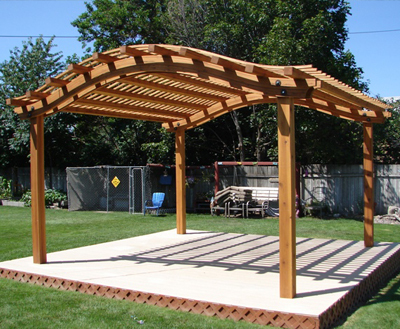 Building a curved roof pergola is not any different from a straight roof design. The same tools and hardware is used. The biggest difference is just in the initial plan drawing and measurements. Once you have determined the slope of the curve that you desire, the post spacing and the total overhang that you want for the roof line, any lumberyard can help you come up with the final dimensions of the curved roof pieces. After that is done, the steps you will need to take to build a pergola like the one above will be the same as for any other. Join 500 homeowners and receive our lesson plan on preparing to build your own pergola. Please sign up with your email on the banner above or in the box below and take our survey. Your responses help us to build our site. In return, you will receive a free pergola plan and also be enrolled to receive a 3 week Pergola Building e-Course that will teach you everything to get you started on your own DIY pergola project. If you’ve decided that you really want to add a pergola to your property, then your next step is to check out our Guide to Building a Pergola in One Weekend. Receive the Pergola Building e-Course including a pergola plan for free! Answer 6 easy questions. Your privacy and email address are safe with us. 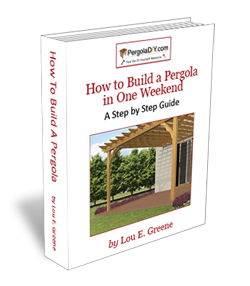 Pergola DIY expert and author of How To Build A Pergola in One Weekend. Do I need a permit to Build A Pergola?